Another consequence of the high mortality rate that the plague epidemics involved was the birth of another art theme: the triumph of Death. Whereas Germany and France preferred the dance of Death, Italy liked that genre better. In this art form, as in the dance of Death and the legend of the three living and the three dead, Death take away the rich man as the poor. Here, Death is not represented dancing, but rather in a furious combat with the living. The exit of the fight is obvious; the Man will be overcome by Death, which is inescapable. Carried out in 1498, this famous wood engraving of Albrecht Durer is the fourth of a series of fifteen, illustrating the revelations of St-Jean, who prophesied the end of the world. The work is entitled:The Apocalypse. 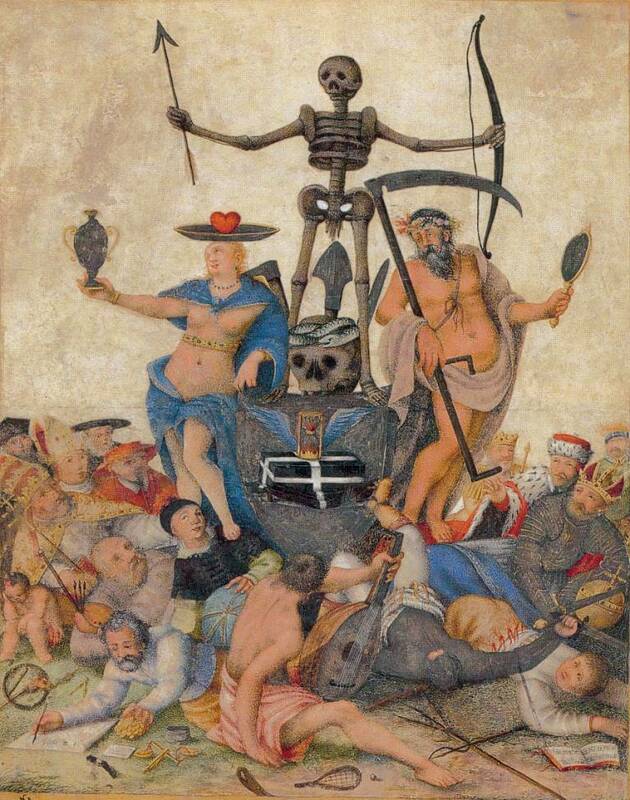 In the Four Knights of the Apocalypse, the riders represent, from left to right: Death, Famine, Discord (sometimes interpreted like the Pestilence) and War. Above an angel watches, the last three tread on men and women of various social classes with their powerful horses, whereas Death - an old rachitic man on a skeletal horse -, throws a bishop in the mouth of a dragon coming out of the entrails of Earth. We are not watching a scene of battle, but a furious and pitiless destruction act. 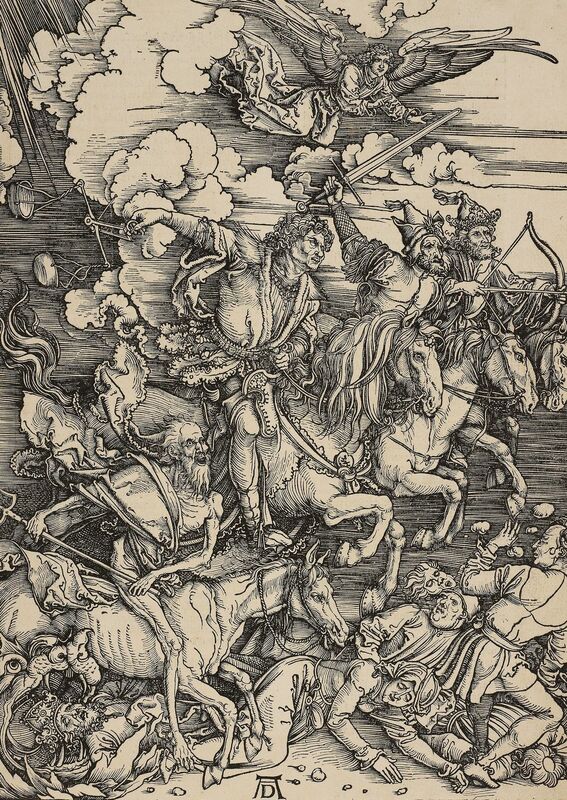 An unusual characteristic of the Apocalypse woodcuts is the absence of text in the illustrations, which preserves the expressive power of the work (the text was printed on the back).The Apocalypse was published by Durer without the help of a patron. He conceived, engraved and published it by himself. This work was published in two simultaneous versions, one in German, the other in Latin, something that had never been done before. This color drawing on parchment by an anonymous master of the beginning of the 16th century, shows Death with a bow and an arrow in its hands,his arm are outstreched in a gesture of triumph over mankind. At its sides strand a man and a woman, half naked. At its feet lie pell-mell some clerics and laymen, as some, representative of arts and sciences - pope, cardinal, bishop, abbot and priest; emperor, king, count, gentleman, soldier and peasant; scientist, usurer, painter, musician and child. 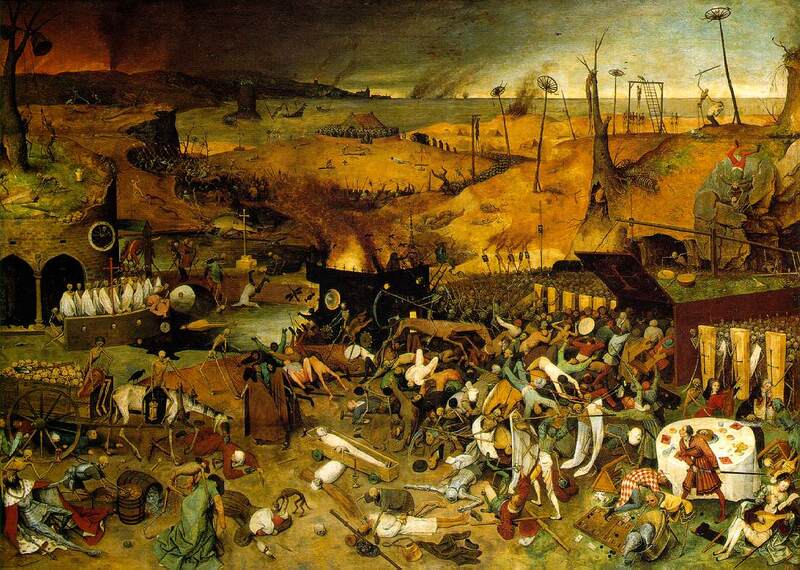 In this vision of end of the world, painted by Pieter Bruegel the Older around 1562, Death is at the center. It is armed with a scythe and rides an emaciated horse. It pushes men in to a crate which the door is marked of with a cross - obviously a trap door... A horde of skeletons invade this landscape; they mow all men without exception, the king as well as the mother and her toddler, the knight as well as the fine ladies, the peasant as well as the lovers playing of the music without noticing the presence of a skeleton behind them. Some card players try to defend themselves with swords; they have not yet understood that any resistance is futile. The landscape mirrors this death: the trees and the grass are dried out, an infernal fires burns behind the hill, everywhere skeletons kill men and women, by drowning, hanging, cutting throats. A man on theverge of being beheaded cries of mercy in vain, his hands in chains. There is not even a promise of redemption or resurrection in this picture. Skeletons toll the bell, there is no hope anymore. It is possible to buy the poster of this work at the store below. 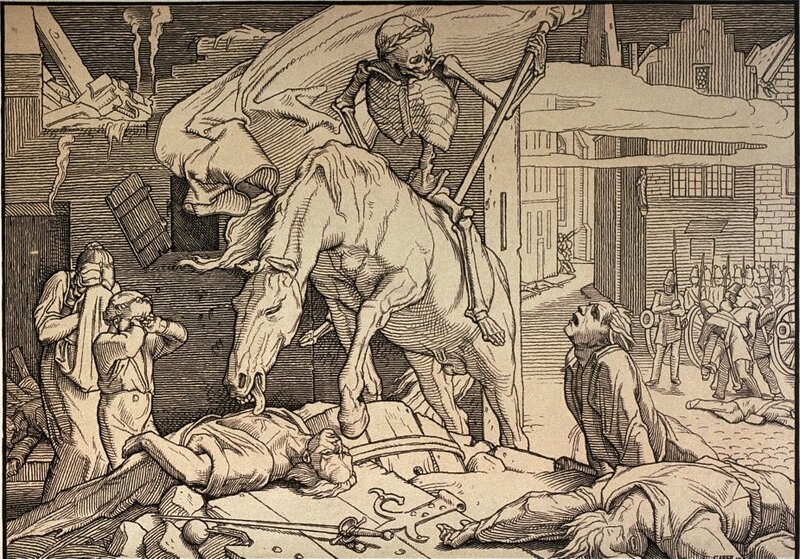 This triumphing Death by Alfred Rethel is part of a series of engravings entitled Another dance of Death of the the year 1848. As a matter of fact, this work was not really a dance of Death, Death is not forming a couple with an individual. The engravingbears well its name of " triumphing Death ". Death itself sits on his horse in front of a destroyed house. At its feet, men are dying on their barricade which the army, on the right, has just destroyed. On the left, a woman and a child cry, undoubtedly mourning the loss of a husband and father. This work was inspired by the bloody repression of the revolution of 1848, it represents Death as the leader and the only winner of this battle. Rethel had lived the revolution as a kind of dance of Death, as formerly the artists had lived the plague. The work had an immense influence, as well abroad as in Germany. This wirk was engraved by Alfred Rethel in 1851. Not only the plague provided an opportunity for the creation of new representation of Death. At the 19th century, another illness infected Europe in waves: the cholera. Rethel drew Death as a cutthroat, and engraved it later, since woodcut was a very popular genre at this time. He was inspired by by an account that the celebrated poet Heinrich Heine had made of the sudden outbreak of cholera in the year 1832, at a masquerade during the carnival of Paris. 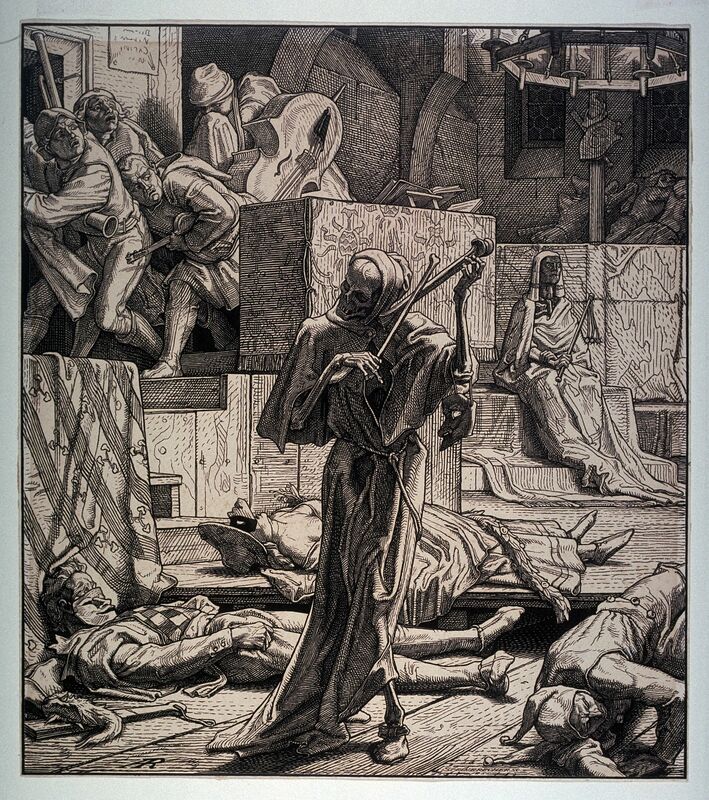 Here, Death plays a kind of violin, while the musicians flee. Close to them,stands a emaciated female silhouette, wrapped in a shroud: symbol of the disease. In the foreground, some people have already died of the cholera.